According to a study by Hubspot, email marketing databases naturally degrade by about 22.5% each year, so these customer email contacts become invalid. So let’s attend to some contact list spring cleaning. One increasing factor coming into play that is raising the need to be mindful of email contact validity (and how it affects your business and relationships) could be DEA influences. We all know that when we’re writing, if there’s a problem and it’s not a valid email address or destination server the mail daemon program will push back to us to let us know and tell us why with a mail bounce message. What about when the address just looks odd (but might be okay) and maybe you have sent mailings and you’re feeling unsure or just not getting a reply or any interaction? Time to put on your detective hat. You can try a resource that’s likely part of your marketing department’s tool chest. There are services that help check addresses, like for when they’re entered live on your web site form. You can even just borrow one for a test drive when you need to. (i.e. Experian, 10 free checks per day for example.) if you just have one address to check once in awhile, try it out. This is another firm that appears U.S. based and It offers 1000 *free* individual verifications per month. Yes, free does make us a bit nervous — even though they promise not to retain or utilize our entries. (Individual address checks are just a taste of their fee-based service though). Note: During our limited testing we saw a more affirmative level of validation language from Neverbounce for some addresses. It felt far more certain in contrast to some results when testing the same addresses with the Experian tool — which is also a very valuable resource. 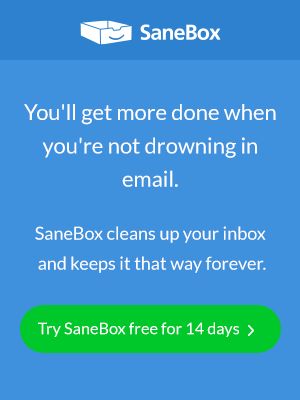 We’d like to round things off by suggesting you follow this link for powerful tips and strategies on email subject line best practices, from the email experts at Sanebox. New email subject line habits can really deliver positive results. Give them a chance and enhance the quality of your email life even further.